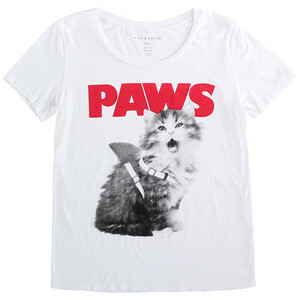 Online updates this week include the Alex & Chloe PAWS Tee! We've been busy updating the online shop with lots of new goodies, including the best cat t-shirt EVER by Alex & Chloe and some new arrivals from One Teaspoon! Shop all the new arrivals here, and remember to check out the SALE section because there are still some amazing scores to be had. Tomorrow is also our LAST DAY inside BYOB *sob* so pop in this evening or tomorrow from 12-7 to say goodbye and check out all these new arrivals in person!